Which CBD Extraction Method is The Best and Why? HomeCBD Processing & ExtractionWhich CBD Extraction Method is The Best and Why? There are multiple ways to extract CBD from hemp, but which one is the best? This article will cover the types of CBD extraction methods from industrial hemp biomass, how they are done and the pros and cons of each process. Each method is used and has various benefits depending on the goal of the extraction and finished product. 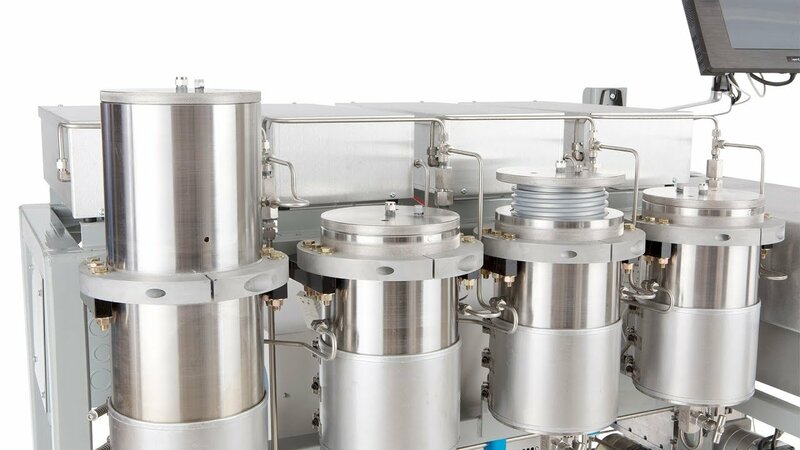 Price is also a factor, the cost of the CBD extraction machinery, length of the process and final yield per lb. will all influence the final cost of the method. Therefore, it is important to know the different types of extraction methods and which one will best suit your needs and budget. In this article, we cover the top 3 most used CBD extraction methods for converting hemp biomass into CBD products (isolate, distillate, full-spectrum, etc.). The CO2 CBD extraction is one of the best depending on the end goal. This method is further sub-divided into three categories; supercritical, subcritical and mid-critical. C02 (carbon dioxide) is a gas but when heated and converted to liquid, it works like a natural solvent. The solvent is what breaks down the raw hemp biomass to eventually turn it into CBD. Supercritical extractions are more efficient than sub and mid-critical for giving higher yields of CBD, however, the higher temperatures damage terpenes and other phytochemicals during the process. Subcritical and mid-critical consistent of less heat and remain more phytochemicals intact, however, less hemp is turned into pure CBD which lowers the yield. CO2 acts as a solvent at certain pressures and temperatures, hence dissolving components found in the hemp plant through a process known as decarboxylation. Although this method is safe and effective, it involves multiple expensive machines. The machines work by freezing the CO2 gas below -70 degrees and compressing it above 75 psi in one chamber. While in this state, it is re-pressurized and heated into a supercritical liquid state in a second chamber. The next step of the process involves increasing the pressure and temperature past the point where the liquid CO2 becomes supercritical. At this point, the CO2 can now adopt properties halfway between liquid and a gas. This means that the supercritical CO2 can now fill a container like a gas, while at the same time maintaining density like a liquid. While in this state, CO2 is suitable for chemical extraction. When it comes to CBD extraction, you start by raising the pressure and temperature of the liquid supercritical CO2 via a compressor and a heater respectively. The supercritical CO2 is then passed through some high-quality hemp or cannabis strains which must be placed in an extractor machine. During this process, the CO2 pulls the essential terpenes, oils, and trichomes out of the hemp plant. The resulting solution is then passed through a separator where it is broken down into its requisite parts. 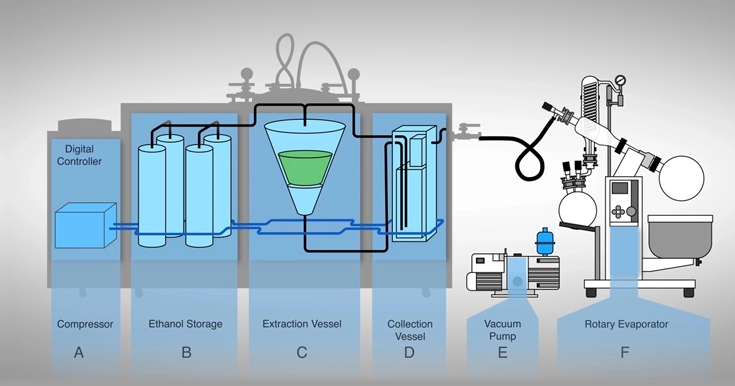 While the essential oils and terpenes are delivered into a collection container, the supercritical gas is passed via a condenser where it is turned into a liquid. The liquid can then be used for another cycle of the process. Purity: the CBD produced is extremely pure. C02 is also a non-toxic, natural substance so any leftover residue is considered to be fully safe for human consumption. Effectiveness: Most food companies have used carbon dioxide as an extraction solvent and safe food ingredient for many years. The methods are perfected and predictable. Expensive: The equipment is very expensive. The process can only be carried out in advanced and sophisticated labs. Lower Yield There is also a lower yield than with ethanol extraction methods. 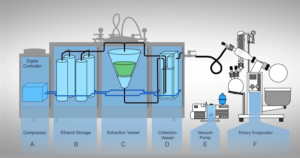 How an ethanol CBD extraction machine works. terpenes and cannabinoids, it may also extract chlorophyll. You can eliminate the chlorophyll by filtering the extract. However, this greatly reduces the oil’s potency. Although butane offers a stronger solvent than ethanol, it is more likely to contain contaminants that may interfere with the functioning of your lungs. For this reason, ethanol is the most commonly used solvent to safely extract CBD from hemp. Whether you are using ethanol, alcohol or butane, the extraction process is the same. The chosen solvent needs to be added to the hemp biomass. The liquid solvent will work by stripping away some of the cannabinoids, terpenes and natural phytochemicals from the hemp. This process is called Decarboxylation. The result of this process after excess solvents have been evaporated is decarboxylated CBD crude oil. CBD crude oil can then be converted into CBD distillate and from distillate into CBD isolate through easy conversion processes (we will cover in another article). Higher Yield: Solvent extraction methods have a higher yield of CBD per lb. of biomass than the C02 extraction method. More Cost Efficient: Ethanol and solvent extraction is a cheaper process involving less sophisticated machinery than C02 extraction. Dangerous: The solvent extraction method is more dangerous as the solvents used are highly flammable and combustible. Solvent Residue: – There are some trace amounts of ethanol solvent left over in the finished product. These residue levels must remain under 0.5% to ensure the finished product is fit for sale. Limited: Ethanol and solvent extraction is suitable for high yield CBD isolate and distillate but not for full-spectrum, essential oils and waxes since it damages phytochemicals and terpenes. If you are looking for how to extract CBD with olive oil, the good news is the extraction method that can be carried out at home or in small-scale commercial settings. Although other oils can be used during this process, olive oil is the most popular. The 1st step involves decarboxylation. This involves heating the hemp plant at some set temperatures for a given period. It aims at activating the plant’s chemicals (decarboxylation). After decarboxylation, the hemp material is added to the olive oil and heated to about 212 degrees Fahrenheit. This step can last for up to two hours. 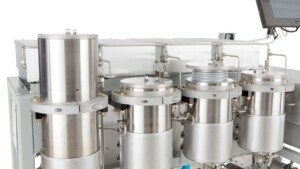 It is at this stage that CBD extraction takes place. Cost: The method is cheap to do on small scale. As you have seen, all the above methods are different in terms of efficiency and cost and desired results. IHF LLC currently offers ethanol CBD extraction, which is suitable for high purity CBD isolate and distillate. We can also covert hemp biomass into decarboxylated crude oil. Just send the hemp biomass to us or buy it directly from us and we do the rest.